Another valuable addition to all these utilities are the brake calipers. A team of engineers from the Bugatti created the world’s first 3d printed break calipers. Let’s dive into the interesting details of these printed calipers. 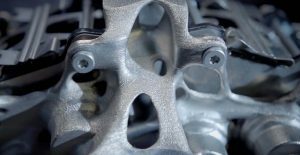 It’s the first time in the history of 3d printing in the automobile industry that someone manufactured a complex machine part using the additive manufacturing. This is made up of solid and durable titanium which kicks in extra performance to the supercar. 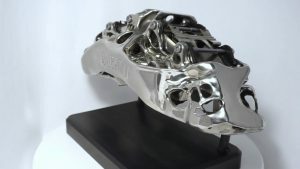 Back in 2018 beginning, Bugatti announced at a press conference that they are planning to print the world’s first 3d caliper which was a huge jaw-dropping decision. And finally, after 1 year, they showcase their first prototype to the whole world which is creating a boom in the automobile industry. Can you guess the testing speed? These calipers were tested up to a whopping speed of 249 MPH (that’s insane, right?) The operation was at such blazing speed that there was spark everywhere. And if you are thinking about the temperature of the titanium disc, it was piping 1,877F. From such brutal testing, we are pretty sure that they are super secure to keep you safe even at rocket speed. For printing the calipers, the engineers required almost 45 hours. To melt the titanium and shape it with perfection requires sheer 3D printing process. It is a long haul and time-consuming operation which is for limited use only because to print an object in a layer by layer fashion at such a high temperature is way too tedious. The latest addition cars (Chiron and Divo) will be having these futuristic break calipers which will help in better controlling of the cars at high speeds. This will be a limited edition release from Bugatti for their supercars only. Just in case, if you have any idea which requires 3d printing, you can turn the idea into execution from any popular metal 3d printing Australia hub. The popularity of online 3d printing is growing day by day and this is just a beginning. As more resources will be available at a lower rate, other car companies will also plan to manufacture their car parts using the additive manufacturing to make the vehicle more futuristic and safer. And not just in the automobile industry, all other niches are doing their research work to launch something more productive.